If you don't have an account already, create your Affiliate account here. 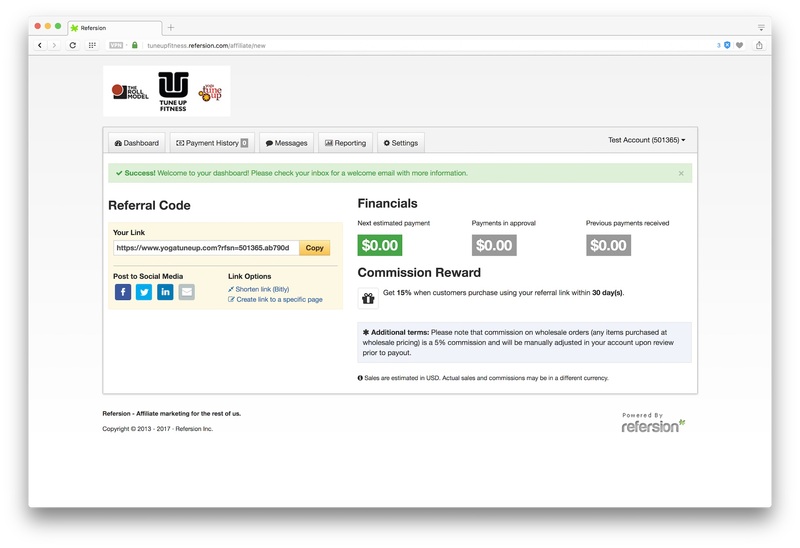 Upon signing in, you will see an immediate overview of your financials—your next estimated payment, payments approved, and previous payments received. We issue our affiliate payouts 4 times per year (March, June, September, and December). You will also see your default Referral Code in the yellow box. You can use this link, or click "Shorten link" in the Link Options section to generate a bit.ly short url (good for social media). 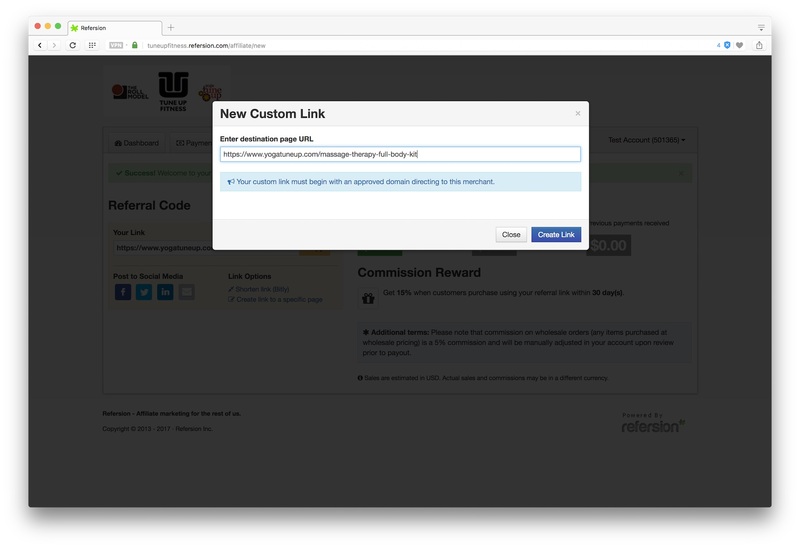 After clicking on the Create Link button, it will display your Affiliate URL for the page you specified, as well as give you the option to create a short link. Affiliate programs know when you send users to a website, so don't worry about what page they land on or what products they're buying. 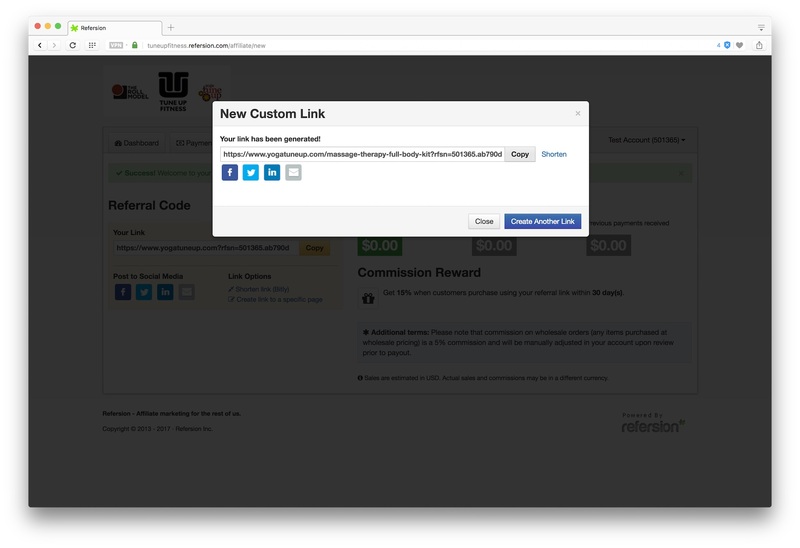 If they come from any of your links you will get credit for that full order. Please note that link clicks are tracked for 7 days only, so orders placed after this time period would not be associated with your account. Here's how our Affiliate commission structure breaks down: You receive 15% of all retail priced product sold under your affiliate link and 5% for all wholesale priced product (wholesale order adjustments will be updated in your account upon review before payouts). Please note that commissions are not earned for personal orders placed through your affiliate link, or for any purchases made by existing, repeat wholesale customers or YTU Teachers. Please note that Tune Up Fitness does retain the right to modify the program and/or commission structure, deny any Affiliate application and/or cancel an Affiliate relationship at any time, with or without notice. Any changes to the program will be updated on our website. 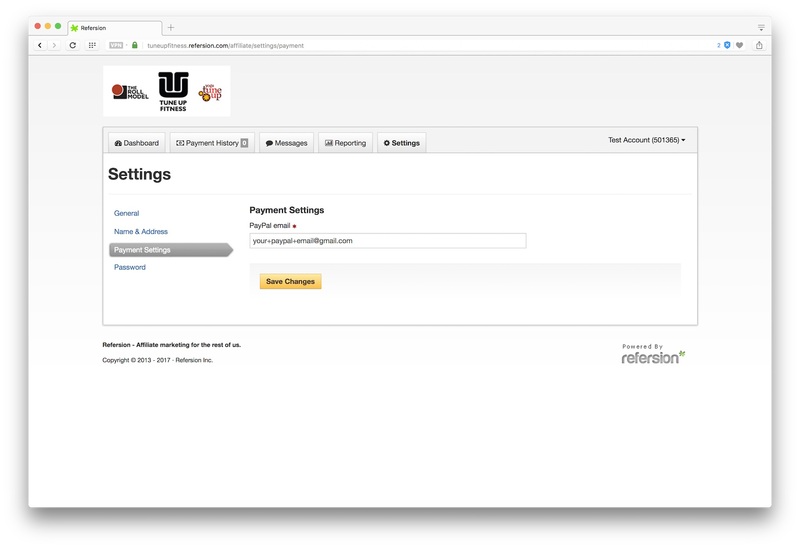 There are 6 sections in your Affiliate portal: Dashboard, Creatives, Payment History, Messages, Reporting, and Settings. The Dashboard page gives you an overview of your current standing. The Creatives page gives you some example banner ads that you can display on your website. The Payment History page gives you a review of your payouts. 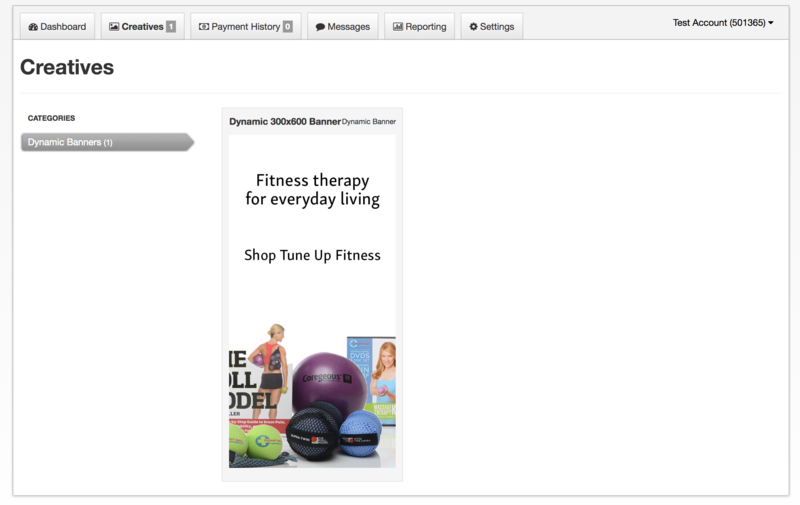 The Messages page allows you to contact the head office through your Affiliate portal, for a faster way to message us. The Reporting page allows you to generate many different types of reports about your account. The Settings page enables you to make changes to your Affiliate account. On the Creatives page, there is a category called Dynamic Banners. These are dynamic ads, which means that we handle the creative and when we update the image, it automatically updates on your website. You can, of course, use your own creative. Instead of a regular image, you copy/paste a small code that lives on your website, and the banner will update when we change the creative (with new photos, new text, etc.). 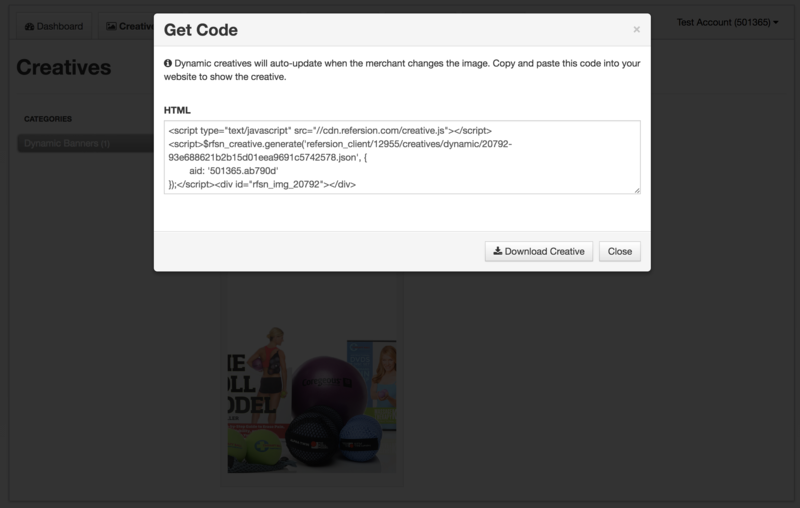 You can also click on Download Creative and a JPG will download to your computer, allowing you to use the current image as a regular image.